COLUMBUS – The tourism economy continues to grow in Greater Columbus where the number of visitors, amount of money spent and jobs supported have increased. Today, Experience Columbus and the Greater Columbus Sports Commission released data from an extensive study on the impact of the tourism and hospitality industry in Columbus and Franklin County. Greater Columbus welcomed 41.1 million day and overnight leisure visitors, sports and arts enthusiasts, convention attendees and business travelers. This is an increase of 3 percent or 1.2 million visitors over 2016. The number of overnight visits grew by 200,000 – a 2.2 percent increase over 2016. On average, an overnight visitor will spend three times more than a single day visitor. Daytrip visits grew by 1 million – a 3.2 percent increase over 2016. Visitors spent $7 billion in Greater Columbus – an 8.83 percent increase from 2015. Businesses serving the visitor industry support 78,000 jobs in Columbus and Franklin County – a 3.88 percent increase from 2015. Tourism supports one in every 12 jobs in Franklin County. Visitors to Franklin County generated $1.25 billion in local, state and federal tax revenue, which provides $2,481 in annual tax savings to county residents. 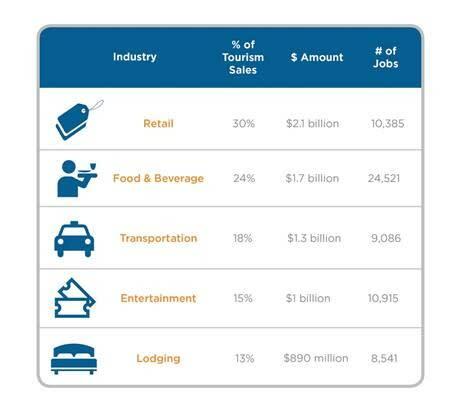 The top five industry sectors benefitting from visitor spending include: Retail; Food and Beverage; Transportation; Attractions, Recreation and Entertainment; and Lodging. Experience Columbus is the destination marketing organization for the Columbus region, dedicated to growing visitor spending that is generated by conventions, meetings, trade shows and leisure visitors. Annually, visitors make more than 41.1 million trips to Greater Columbus, spending $7 billion and supporting nearly 78,000 jobs. For more information, visit experiencecolumbus.com.